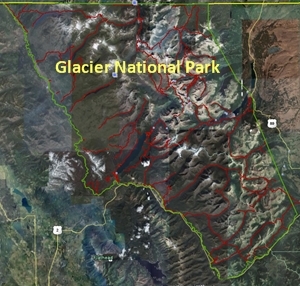 The photos of nature and wildlife in Montana are from Glacier National Park, a huge — 4,101 km² — park on the border between Canada and USA. It's one region of protected land as large as 44,000 km² in north western corner of USA. Glacier National Park borders Waterton Lakes National Park in Canada —the two parks are known as the Waterton-Glacier International Peace Park.